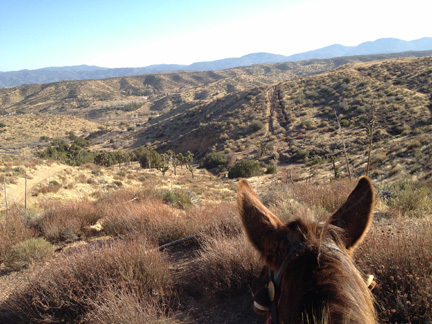 Tobe continues to be enrolled at the Jerry Tindell Mule & Horse School, so after working on commands and posture in the arena we relaxed and went out for a stroll in the high desert. Difficulty: None! We just went for a walk around in the cold windy desert. A dog did come out to defend his property, that was the only scary moment, but we chased him back inside his gates three times before he finally realized this mule was not going to be a victim! 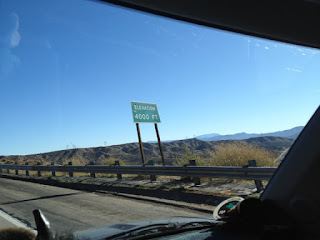 The drive from the coast up to the high desert takes me 3 hours............ and I see amazing things on the highway! 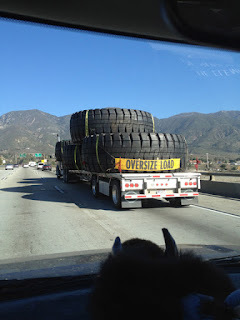 This was the biggest set of tires I have EVER seen, slowly heading up the Cajon Pass. And there's the 4,000 foot elevation sign at the top of the pass, WAY above my humble beachside home. 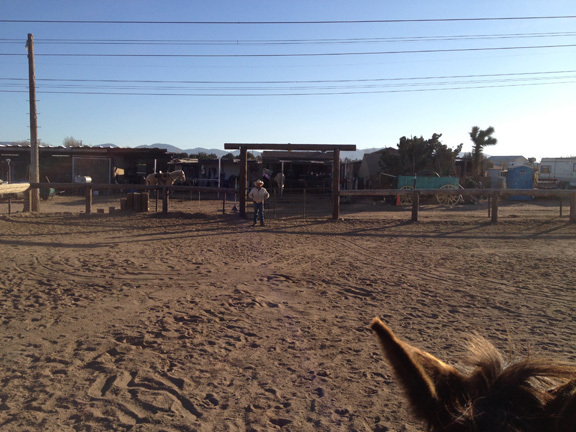 It is pretty epic for me to make the trek out to do lessons, but if I don't I won't improve, and Tobe can get perfectly tuned up and I'll just erase it! I'll pet it right off of him! 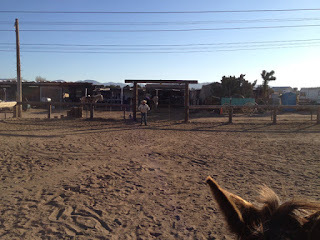 There's Jerry Tindell in the arena, he may look like a little elf way over there but he SEES EVERYTHING and if he tells me often enough I do too! Today, after reviewing the videotapes from last week, I was able to start to correct some things that have been very difficult for me to learn. I would still catch myself beginning to do them wrong but then I'd stop and correct the movement .... thats the next step toward better control. Tobe is pretty sure HE knows it all already, I think. He's waiting for me to catch up. Right now I'm learning two vital and compatible things. First, to use my feet and legs to give the signal for what I want and not just my hands. Then, to recognize and respond when he does the right thing and back off, let him know he did it right. The timing and awareness required are a big challenge for me. 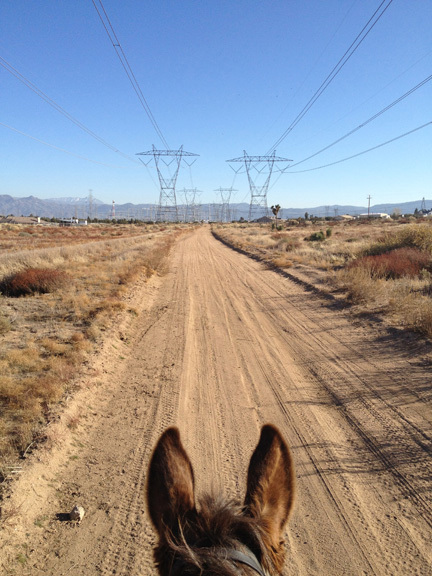 Never ceases to amaze me how interesting things look from the back of a mule. I really wouldn't want to just go for a walk down this dirt road, but riding there is an opportunity and a challenge! It is such a multifaceted activity, stretching awareness on so many levels. 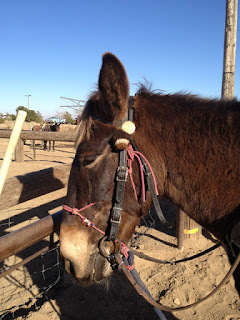 I can be paying attention to my posture, or to his ears and other signals about what he is looking at. And then if I am feeling like a rush I can ask him to canter, and we fly along and it is my manifest equestrian destiny, to feel at one with my mighty steed. The strange entrance to the electrical power station, clearly not a place we need to explore the inside of. This canyon drops down and has palm trees in the bottom, and a wealth of old junker cars that look like generations of hot rodders have used it for a lovers' leap. 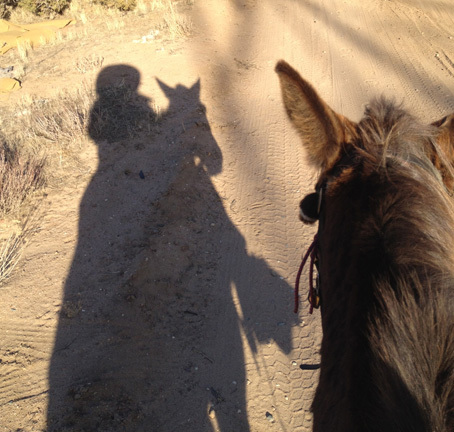 I lobbied for a trip down into it ... but my companions were timid, and I was in that mode just a few brief years ago, so I am always in concordance with the cowgirl rule that you ride to the comfort and ability of the least rider. The MOST important thing is that no one get hurt. As the afternoon sun started to slant we headed back, hot coffee and conversation around the kitchen table were starting to sound mighty good. 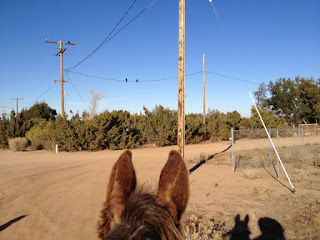 Two ravens watched us go by from their high wire observation post. Hugin and Munin, Odin's birds, thought and memory. 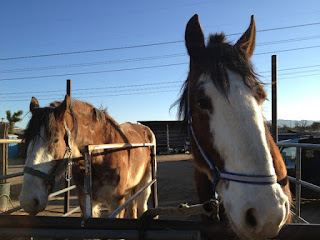 Back at the ranch I got Tobe untacked and set up with a bucket of treats and then took photos of some of the other students enrolled as his classmates. This set of Clydesdales are learning to be a matched hitched team for pulling wagons. 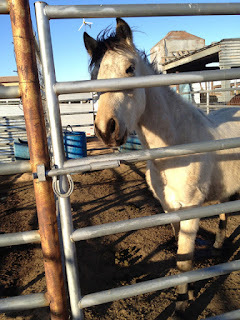 This young buckskin filly is just learning she's a horse, and getting a good start here. 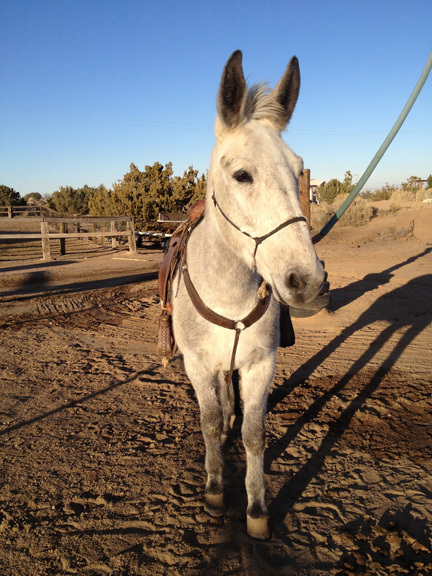 Blue the mule, he knows it all already, he's along for the ride. 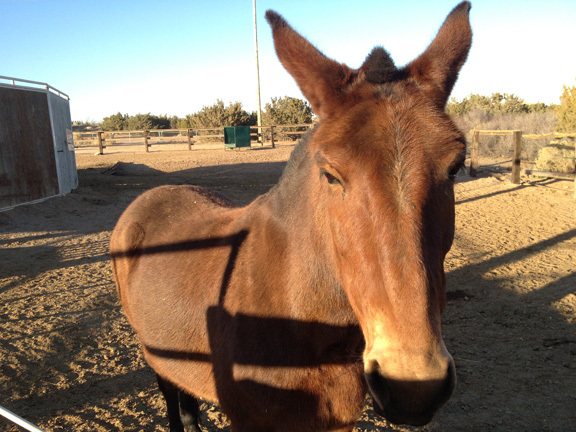 Earl mule, he's lived here so long he is sure everyone works for him. 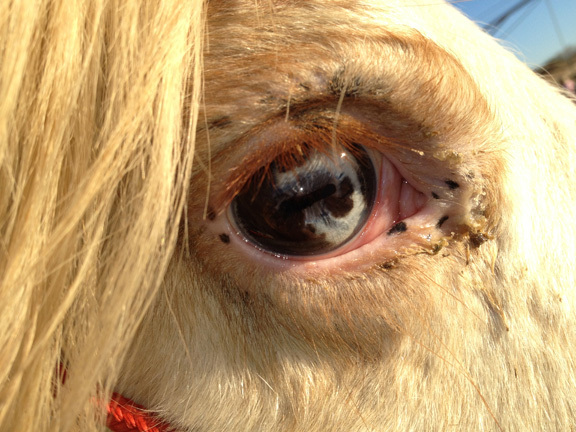 And this white horse had one normal dark eye and then this amazing marbled eye, part light blue and part dark. Quite the sight! 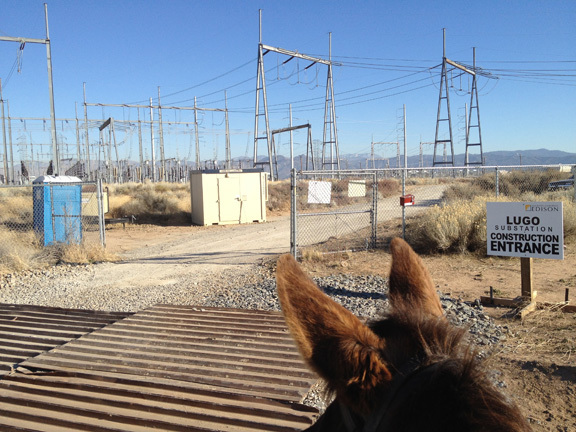 You just never know what you'll see if you keep looking!